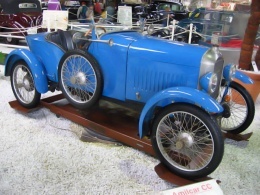 Amilcar Italiana manufactured some French Amilcar automobile models in Italy from 1925 to 1928 under licence granted in 1925 to Compagnia Generale Automobili S.A.,of Rome to build cyclecars and in 1927 to Societa Industriale Lombardo Veneta Automobili of Verona. This French House was founded with the name ofNouvelle Société pour l'Automobile Amilcar. The name derives from the merger Amilcar and dall'anagramma, with some forcing, the surnames of the two main founders, Joseph Lamy and Emile Akar. Two other characters, however, participated in the foundation of Amilcar, namely André Morel and Edmond Moyet. The seat of Amilcar was established early to Saint-Denis. The proposal was the first car in 1922 CC, a small car classifiable as autociclo, a coach who collected some success, particularly thanks to his skills sportiveggianti that allowed shine in various competitions and make known the brand to the public, that of Amilcar began to appreciate the excellent quality / price ratio. Along with the mechanical models were proposed conventional therefore with some solutions adopted at only a few houses, such as distribution valve in the head. Thus was born the CGS, which helped maintain the high reputation that sports hovered house on Saint-Denis. As far as sports, the brand to beat for Amilcar was the Salmson, which could always surclassare the Amilcar thanks to its more modern engines and equipped with axes cam in the head. A new sports largest and most powerful of the first two, so he saw the light in 1926,: born C6, with engine to 6 cylinders supercharged. In this way, Amilcar managed to beat the Salmson, giving the green light for a career agnistica that had continued until 1949, beyond the cessation of the House. But Amilcar production is not limited only to vetturette sports simultaneously cars also appeared to call family and coaches, such as Type E and Type L .
Following were introduced new cars touring even equipped with a 8-cylinder. 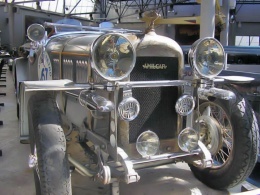 Starting from 1928 Amilcar opened a factory in Italy, and exactly Lecco(CO), where Amilcar were produced under license. At the end of that year, however, the Italian adventure ended. Other establishments from the outside of France were open in Germany and Austria. During the '30s, production continued, but more quietly, without much outcry. In any case, was not neglected either branch of touring cars, or that of sports cars. In 1937, Amilcar was detected by Hotchkiss In this period, the most prominent was the Compound, which proposed some interesting solutions, such as front wheel drive, the alloy monocoque structure of aluminum and suspensions to wheel independent on both axes. The production of Amilcar ends in 1939.